We've had such a wonderful experience putting on the last two conferences, so we are eagerly looking forward to this year's one! We have a stellar line up of speakers and as usual there will be a great selection of exhibitors, and of course who could forget the infamous WAPF lunch made from carefully selected locally sourced organic ingredients. 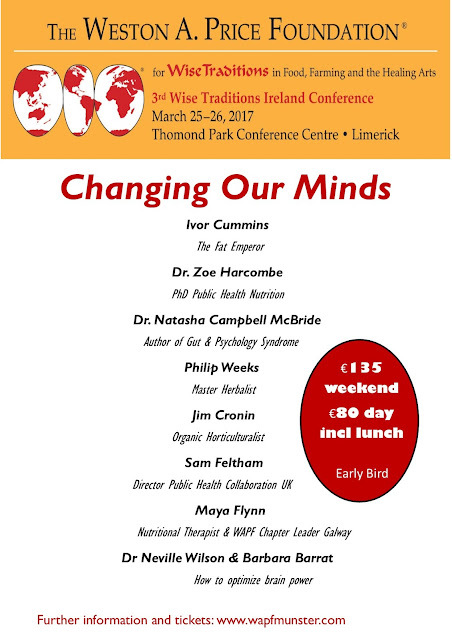 This year's theme is "Changing Our Minds" and will focus on the nutritional foundations of a healthy mind (and body!) and also discuss if we need a change of mind on the official diet advice from the mainstream diet dictocrats!